d - a Cool the air at constant pressure back to its initial condition. The components of a Brayton cycle device for jet propulsion are shown in Figure 3.14. We will typically represent these components schematically, as in Figure 3.15. In practice, real Brayton cycles take one of two forms. Figure 3.16(a) shows an ``open'' cycle, where the working fluid enters and then exits the device. This is the way a jet propulsion cycle works. 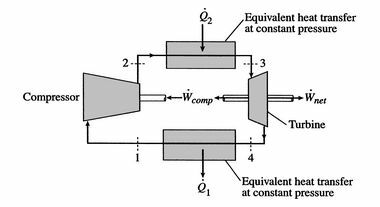 Figure 3.16(b) shows the alternative, a closed cycle, which recirculates the working fluid. Closed cycles are used, for example, in space power generation. Figure 3.14: Schematics of typical military gas turbine engines. 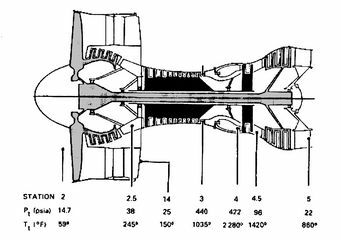 Top: turbojet with afterburning, bottom: GE F404 low bypass ratio turbofan with afterburning (Hill and Peterson, 1992). where , are defined as heat received by the system ( is negative). We thus need to evaluate the heat transferred in processes - and - . We can see this by writing the first law in terms of enthalpy (see Section 2.3.4) or by remembering the definition of . Figure 3.17 shows pressures and temperatures through a gas turbine engine (the PW4000, which powers the 747 and the 767). 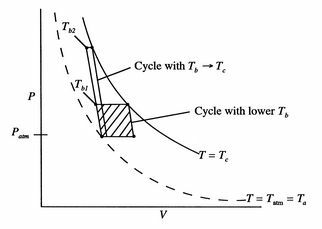 Equation (3.10) says that for a high cycle efficiency, the pressure ratio of the cycle should be increased. This trend is plotted in Figure 3.19. Figure 3.18 shows the history of aircraft engine pressure ratio versus entry into service, and it can be seen that there has been a large increase in cycle pressure ratio. The thermodynamic concepts apply to the behavior of real aerospace devices! The turbine entry temperature, , is fixed by materials technology and cost. (If the temperature is too high, the blades fail.) 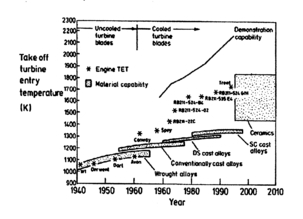 Figures 3.20 and 3.21 show the progression of the turbine entry temperatures in aeroengines. 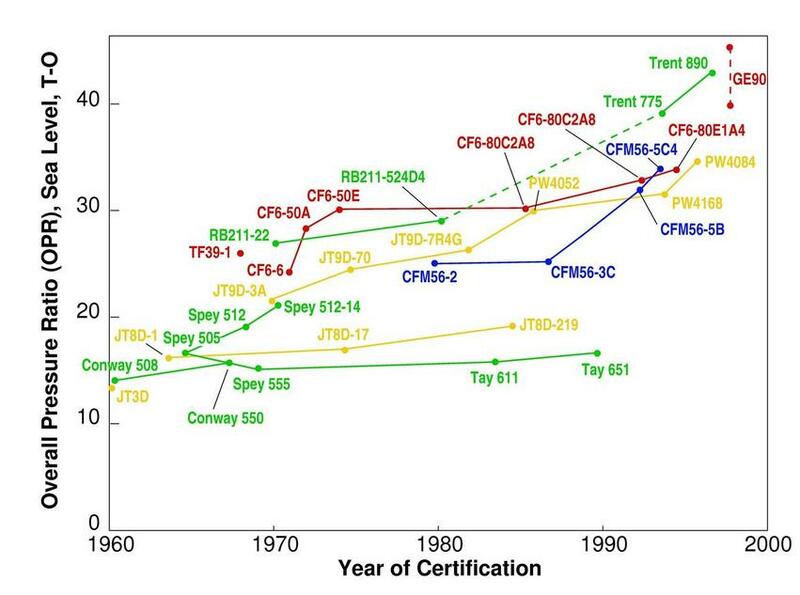 Figure 3.20 is from Rolls Royce and Figure 3.21 is from Pratt & Whitney. 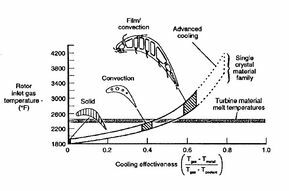 Note the relation between the gas temperature coming into the turbine blades and the blade melting temperature. 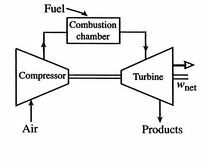 For a given level of turbine technology (in other words given maximum temperature) a design question is what should the compressor be? What criterion should be used to decide this? Maximum thermal efficiency? Maximum work? We examine this issue below. The problem is posed in Figure 3.22, which shows two Brayton cycles. For maximum efficiency we would like as high as possible. 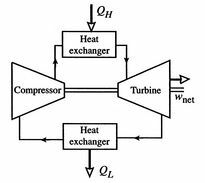 This means that the compressor exit temperature approaches the turbine entry temperature. The net work will be less than the heat received; as the heat received approaches zero and so does the net work. The net work in the cycle can also be expressed as , evaluated in traversing the cycle. This is the area enclosed by the curves, which is seen to approach zero as . The conclusion from either of these arguments is that a cycle designed for maximum thermal efficiency is not very useful in that the work (power) we get out of it is zero. 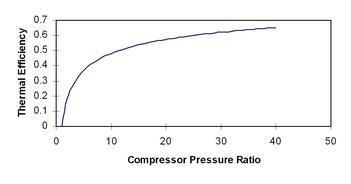 The trend of work output vs. compressor pressure ratio, for different temperature ratios , is shown in Figure 3.23. Figure 3.24 shows the expression for power of an ideal cycle compared with data from actual jet engines. Figure 3.24(a) shows the gas turbine engine layout including the core (compressor, burner, and turbine). Figure 3.24(b) shows the core power for a number of different engines as a function of the turbine rotor entry temperature. The equation in the figure for horsepower (HP) is the same as that which we just derived, except for the conversion factors. The analysis not only shows the qualitative trend very well but captures much of the quantitative behavior too. A final comment (for this section) on Brayton cycles concerns the value of the thermal efficiency. 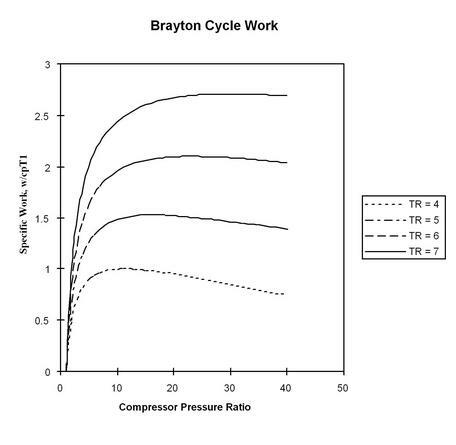 The Brayton cycle thermal efficiency contains the ratio of the compressor exit temperature to atmospheric temperature, so that the ratio is not based on the highest temperature in the cycle, as the Carnot efficiency is. For a given maximum cycle temperature, the Brayton cycle is therefore less efficient than a Carnot cycle. 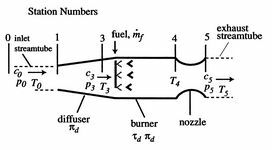 A schematic of a ramjet is given in Figure 3.25.
: Isentropic diffusion (slowing down) and compression, with a decrease in Mach number, . : Isentropic expansion through the nozzle. See also Section 11.6.3 for other figures of merit. MIT operates a Brayton cycle power generator on campus. For more information, see the website at https://cogen.mit.edu/ctg.cfm .